Here you can access a number of stand-alone tools which exploit the SCOTS corpus data. 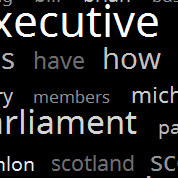 The Collocate Cloud tool creates a tag cloud of up to 100 collocates for a chosen word in the SCOTS corpus. The size of the word reflects frequency of usage and brightness reflects collocational strength. 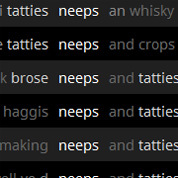 ComPair presents a visualisation of the strength of the collocates in the SCOTS corpus of pairs of chosen words. 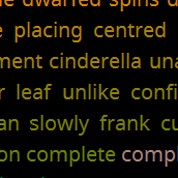 The MI (Mutual Information) Concordance tool shows a chosen word in a key word in context concordance with the words in the span highlighted according to their MI score.